Greenland flags were flying at half-mast on Wednesday, Greenland's national day. Greenland flags were flying at half-mast Wednesday across Denmark and in Greenland's capital, Nuuk, to mourn four people who are presumed dead after a tsunami flooded a village on the Arctic island's west coast. 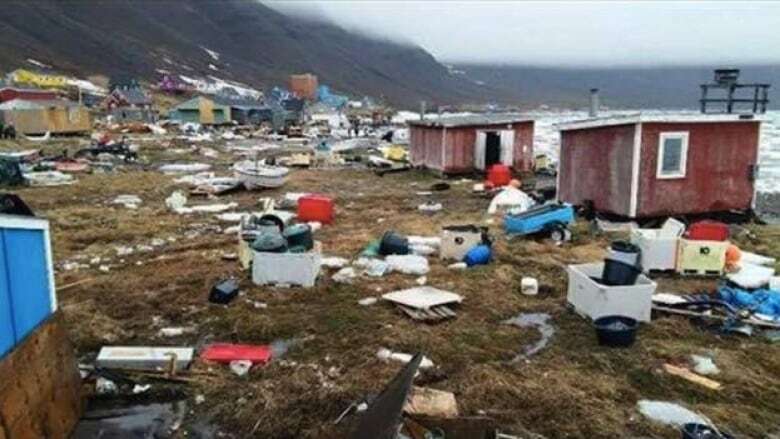 Police spokesman Bjoern Tegner Bay said the missing are a family of three, including a child, and an elderly man from the settlement of Nuugaatsiaq, which has some 80 inhabitants. Their homes were washed into the sea while they were still inside them. A landslide into the sea from a mountain across the fjord from the settlement on Saturday sent water surging onto the land, destroying 11 houses. "This is the worst thing that could have happened — the flood cost loss of human lives," Greenland Premier Kim Kielsen said in a statement. The Arctic island of Greenland is an autonomous part of Denmark. As June 21 is Greenland's national day, the red-and-white flag with two horizontal bands and a disk, known by its Inuit name Erfalasorput, was flying atop official buildings. But because of the tragedy, it was lowered to half-mast. A few thousand people had gathered in Nuuk for the national day traditional parade through the capital with Greenland flags, speeches and songs. The event started with a minute of silence. said, according to Greenland's main newspaper Sermitsiaq. The search for the missing was temporarily stopped Tuesday due to fog, ice and currents. Police said it would resume when the weather permits.